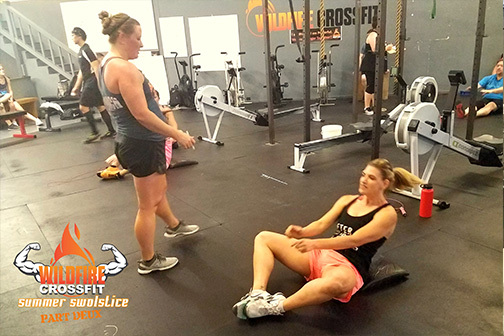 Friday night, we blew it up at WildFire CrossFit with part 2 of the Summer Swolstice! After the first event which was a partner workout, the individuals took the stage to push each other to be their best. 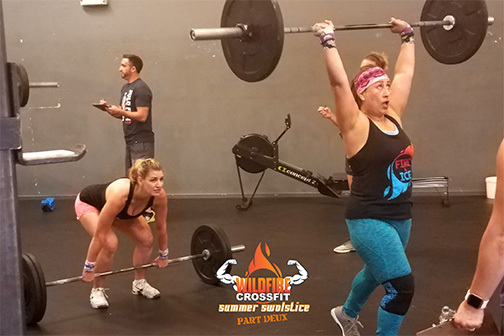 There’s just something about the competition setting that brings out the best in athletes, and the members of the WildFire Community stepped up to the challenge. 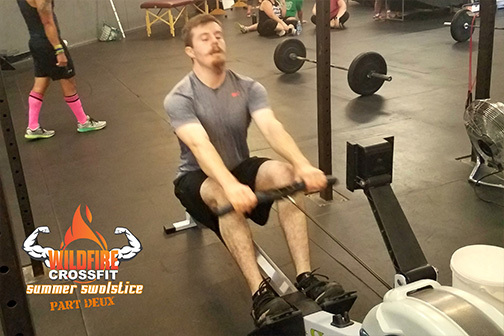 We changed things up with this event by allowing the members of the WildFire Community submit workouts and then vote on the ones they would want to do and see for part 2! We got a lot of great submissions, some that may still see in part 3 on Friday, August 10th which will be for Teams of 3. Workout #1. 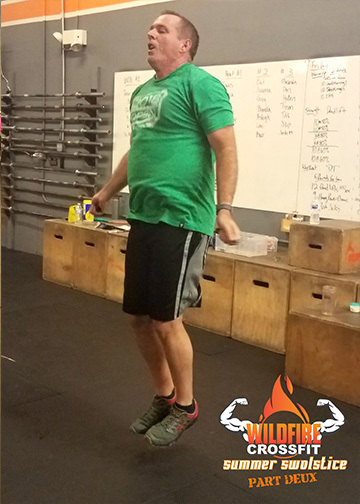 “This WOD’s for Yu”, was a variation on “DT” where athletes had 7 minutes to complete 3 rounds of DT which is 12 Deadlifts, 9 Hang Power Cleans, & 6 Push Jerks at 115/75 for Rx and 95/55 for individuals. Then, athletes rowed for max effort calories in the time they had remaining. The total number of calories rowed was the final score. Thanks to Henry Yu for the workout submission. It was a lot of fun, and for many athletes, they were able to push the envelope and complete the workout as prescribed. Great Job everyone! Workout #2, “Brandy’s Got Your Gunz”, was a variation on the CrossFit classic, “Annie”. 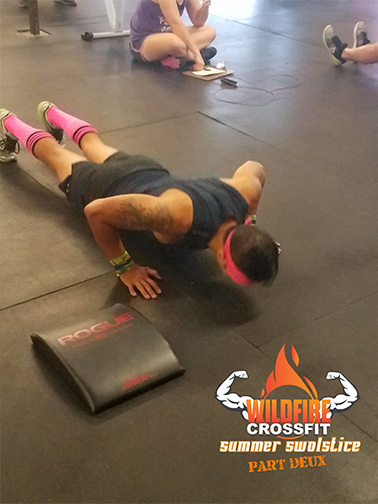 In addition to the reps of 50-40-30-20-10 Double Unders (or Singles for scaled) and Sit Ups, athletes had to complete 20 Push Ups after each round. Thanks to Brandy Burrows for the workout submission. I think everyone thought of this WOD when they laughed and sneezed for the rest of the weekend! When it was all said and done, we had a great time, and true to Monica's shirt, we had Tacos, a few beers and a lot of laughs! 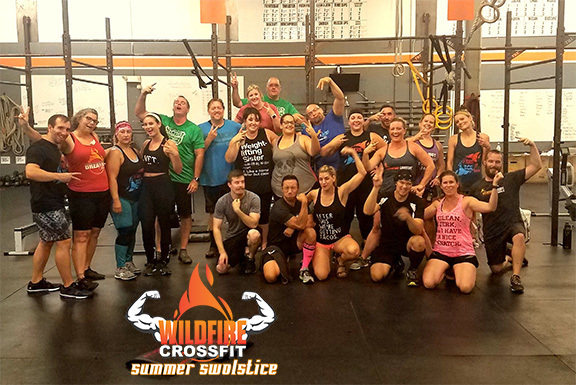 Great Job to all of the athletes who participated in the 2nd edition of the Summer Swolstice at WildFire CrossFit! The last event is going to be AWESOME, so find your teammates and get ready for some fun Friday, August 10th at 5:30pm.